The Manifold Ghosts Of Christmas: In Wales, Dickensian London… And Space. Hello You. Hope you have had a splendid Christmas with lots of family, food and fun in the correct ratios. I got two whole days off and spent them mostly outside surrounded by a blur of dogs, so I was happy. I was even happier on Boxing Day, which brought glad tidings of not one but two lengthy packages aired by the BBC that evening, in spite of my being ensconced up in the hills of Cumbria in the midst of the aforementioned canine-blur. Thanks to these tidings, I’m able to finally share with you a short radio drama I produced a few months ago with award-winning Nigerian-American author Nnedi Okorafor. It’s a piece of fiction she wrote inspired by a particular 419 Scam letter that went viral earlier this year. It’s traditional to tell each other spooky stories at this time of year, but today we’re bringing you something a little bit different. The Nigerian American writer Nnedi Okorafor has had a particularly busy year, with her science fiction story Binti winning both the 2016 Nebula and Hugo Awards for best novella, adding to the long list of accolades for her stories that explore other worlds and fantastical realms while retaining a strong connection to her Nigerian heritage – part of a wider tradition that has become known as ‘Afrofuturism’. Incidentally, it may interest you to know that the various sounds of ‘The Thing’ that features in the story were largely created with handfuls of paper and soap, while the bleeping spaceship atmosphere was provided by analogue synth tinkerer Mr. Jonny Stutters. You can find the transcript as it appeared in Clarkesworld here. The post also features the original audio files of the story, which can be accessed directly here. But for the full effect, listen again to Focus On Africa’s Boxing Day edition here for the next thirty days or so. Extra special thanks to Nnedi and Tchidi for being such a pleasure to work with, Haruna, Maura and Rachel from the BBC’s African services, Jonny and his magic bleeping boxes and of course to Clarkesworld Editor-in-Chief Neil Clarke for allowing us to broadcast it in the first place. Much obliged to you all! All this excitement was followed a few hours later by something much more earth-bound and traditional, a seven-minute report I produced on the history of audiobooks at Christmas that closed that evening’s edition of The World Tonight on Radio 4. 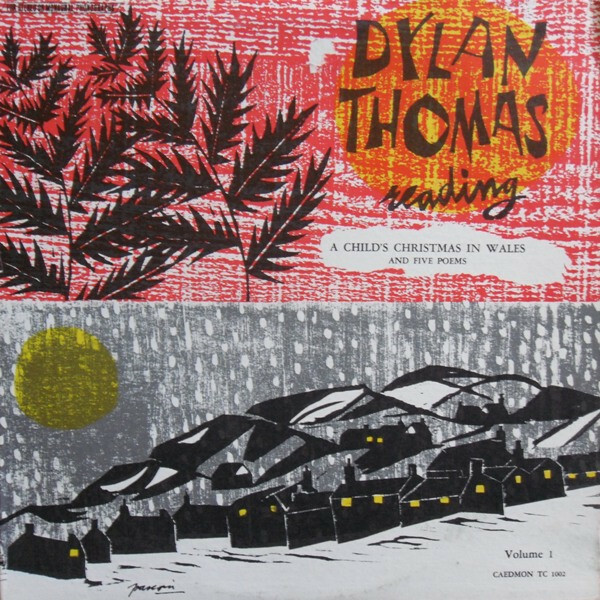 Introduced by Matthew Rubery, author of recently-published The Untold Story Of The Talking Book, it features numerous ghosts of Christmas past – quite literally with the inclusion of a 1934 recording of perennial favourite A Christmas Carol as well as the vintage voices of Charles Laughton and Dylan Thomas bringing us some festive tales of days gone by. You can listen to the feature as it went out on The World Tonight on the BBC website here (about half an hour into the programme) for the next few weeks, thought it’s probably best consumed within the next day or so, while savouring your last vestiges of Christmas cheer. I was regrettably unable to personally capture this moment – commuters were tutting and zig-zagging past me, plus my phone doesn’t even have ‘Snake’ on it – but thankfully fellow sound-shaper Janine A’Bear responded to some frantic texting and took the above photograph from her garden in Amhurst Road. Of course a mere snapshot could never do justice to the full incomprehensible wonder of the celestial miracle being worked high above our heads (the moon being quite a long way from Hackney, after all), but I do hope it offers you some idea of the kind of mystical forces that are clearly throwing their cosmic heft behind this latest project – bending the conventional laws of physics to give the UK’s premier experimental tape-loop quartet a lunar leg-up. I hereby have the utmost confidence in proclaiming Howlround the first ever band to successfully incorporate a heavenly body into a promotional campaign and to henceforth brand this the greatest and most cost-effective piece of viral marketing EVER. How you like them silver apples, Coca Cola?! Thanks also to everyone who came down to IKLECTIK the following evening for the official launch party, held as part of a two day residency by sound artist Pascal Savy. The event featured live performances from Pascal, Steve under his Merkaba Macabre alias and of course ourselves; as well as the premier screening of the A Creak In Time in front of an extremely enthusiastic audience. Could their be a more appropriate venue for launching such a project into the world than this secret corner of central London that still retains much sense of its previous life as a Buddhist monastery? Thanks once again to Pascal for inviting us. Hoping to hear new music from him in 2017 as well! Right, that’ll do it for now. Suppose I’d better get cracking on putting my end of year music mix together. It’s been a particularly bumper crop for 2016, which given the state of the world at the moment is just as well…. Up The Creak! – New Howlround LP / Film Now On Pre-Order And There’s A Premier Screening Too! Hello You. And welcome to a most exciting and auspicious day in the History of Howl! For it is today that, following a seemingly endless period of keeping the whole thing under our hats, I can finally reveal to you Howlround’s latest and greatest work, a unique audio-visual project produced in collaboration with filmmaker Steven McInerney and bearing the title A Creak In Time. Two years in the making, the original soundtrack LP is now available to pre-order from the Psyché Tropes label, pressed on heavyweight 180g vinyl with printed inner sleeve. Plus each copy comes complete with digital album download and a link to stream the film in full online. All that for a bargain £12 plus shipping. Not too shabby! It’s a hugely proud moment to be sharing this with you, it’s been a long trip putting this project together we’ve been stubbornly refusing to let anything out the gate until it was just right. Steve in particular has been a real lynchpin, agonising over every shot, every cut and every frame – but as you can see from these production stills it’s been more than worth the effort. Just take a look at some of the images below, they’re nothing short of astonishing! The players: Comprised of Robin The Fog, Chris Weaver and four reel to reel tape machines, Howlround create unique and immersive compositions and performances by direct manipulation of natural acoustic sounds on magnetic tape, with all additional effects and artificial reverb strictly forbidden. For this soundtrack, their most ambitious yet, the group have created a striking body of work made entirely from field recordings of different objects creaking: tiny and insignificant sounds, that, when amplified and extended via magnetically charged oxide particles begin to take on a curious new identity. …Taken from source material discovered in London, Yosemite and the Mojave desert, these sounds, through simple manipulation, gradually cast off their moorings and head into space, leaving their original identities far behind and chiming perfectly with the film’s recurring themes of transformation and altered perception, switching scale in a heartbeat from microscopic topography to the vast distances of the cosmos. Shot entirely on 16mm film with a musique concréte soundtrack, it’s both science and fiction and marks a dramatic new direction for all involved. The Director: Steven McInerney is an Australian born multidisciplinary artist based in London. He is the founder of Psyché Tropes, an experimental label and film project focusing on the synaesthetic intersections between sound and its visual counterpart. Working predominately with 16mm and sound he creates recherché non-narrative works using in-camera and camera-less filmmaking techniques while performing live audio visual shows as Merkaba Macabre. Making Planets: Steven McInerney on the set. Of course any album worth it’s 180g needs a launch party and it just so happens that we have two – sort of! First off there’s the Official Launch and Premier Screening of the film at London’s Iklektik on Saturday 10th December as part of a two-day residency by artist Pascal Savy. It will be the first ever public outing of A Creak In Time and there will be live performances by Howlround, Steve’s Merkaba Macabre alter-ego and of course Pascal himself to celebrate. A former Buddhist temple and one of the Capital’s best-kept secrets, we can’t think of a more appropriate venue from which to launch this new project in style! Further information is available here and tickets, which are expected to sell sharp-ish, can be found here. Please come celebrate with us if you can! If you can’t make Saturday night, Howlround will also be playing a (moderately!) more traditional tape loop set at the world-famous Brunel Museum the following evening, Sunday 11th December. No stranger to unusual venues, we’ll be spooling up inside the tunnel shaft itself alongside Lee Patterson, Áine O’Dwyer and Wajid Yaseen & Anthony Elliot, all at the behest of of Goldsmiths as part of their regular EAVI events. OK, so not exactly a launch party per se – it would be a little cheeky/wildly inaccurate to suggest that all these goodly folk were gathered here purely because we happen to have a new record to show off, but we’re certainly hoping it will help spread the word a little further. Tickets are available here. NB as both of these events happen to be spread over the weekend, do please make sure you’ve got the right dates! Tickets to the Premier Now Available! Hurrah!